Ancient Greek boxing dates back to the eighth century when it was considered an important part of Greek athletic culture. There are numerous legends related to the birth of boxing as a sport in ancient Greece. The earliest legend holds that the heroic ruler Theseus invented boxing. In his version of the sport, two men sat facing each other and beat each other to death with their fists. As time passed, the sitting positions changed into standing, and the boxers started to wear gloves with spikes. They fought completely naked. Another legend is told through the work of Homer. 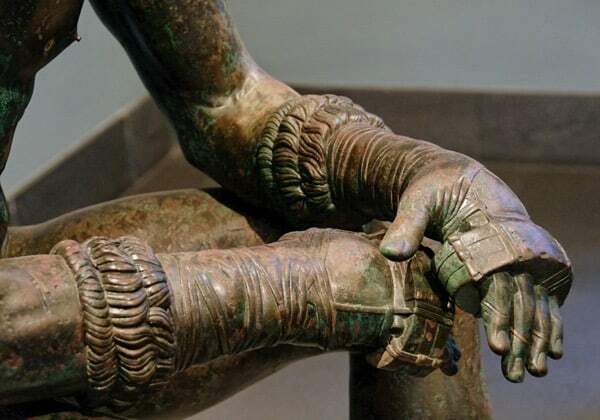 In his Iliad, Mycenaean warriors included boxing as a way of honoring the fallen. Boxing was listed among the contests that were held in memory of Achilles who died in the Trojan War. Unlike modern-day boxing, there was no distinction between weights and ages. The competition was not divided into rounds but it ended when one of the competitors gave up or was killed, or both were exhausted and finished by mutual consent. Moreover, any blow with the hand was allowed apart from to gouge out the eyeballs. Holding or wrestling each other was prohibited. If the fight went on for too long, competitors were allowed to exchange undefended blows to speed up the process. We know that chariot racing began during the Mycenaean period from artistic evidence on pottery, and the chariot race is believed to be the event that started the Olympic Games. According to the ancient Greek poet Pindar, King Oenomaus challenged his daughter’s eligible suitors to race against one another. Pelops won the race and the Olympic Games were born in honor of his victory. Homer’s Iliad is the first literary evidence of chariot racing held at the funeral games of Patroclus. 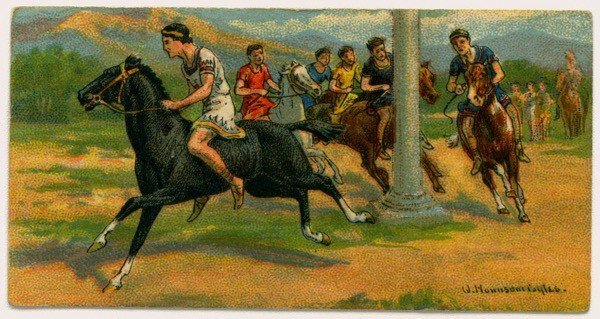 In the ancient Olympic Games, as well as the Panhellenic Games, there were both four-horse and two-horse chariot races. Apart from the number of horses used, the rules were the same for both. The sport was first added to the Olympics in 680 BC. Initially, the event took place on one day and was later extended to a two-day event. 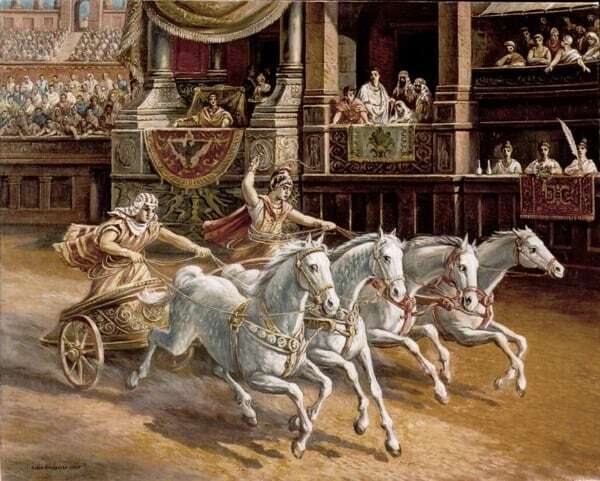 Chariot racing was the most important event out of all other equestrian events such as racing on horseback, and traditionally took place on festival days. The races were held on a wide, flat, open space called a hippodrome. A firm favorite with ancient Greek crowds was “pankration,” a form of martial arts that combined boxing and wrestling. It was launched back in the second millennium BC and was undoubtedly considered to be one of the toughest and most dangerous games: from gouging out the eyes to strangling, everything was permitted. 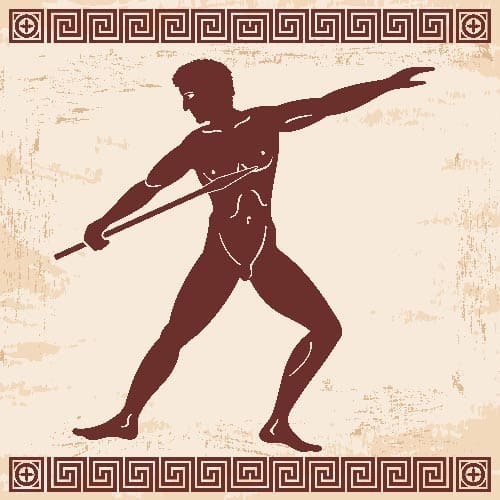 In 648 BC, the game was introduced to the 33rd Olympic Games in Greece. It is believed that Theseus, the founder and king of Athens, invented pankration. He allegedly used this unique combination to defeat the half-human, half-bull creature, the minotaur, which was locked in the Labyrinth of Minos. Also from mythology, Hercules is said to have won a pankration contest in Olympia. Many Greek vases depict the hero conquering the Nemean lion using a strong lock which is a method used during pankration fighting. The sport had two main phases. 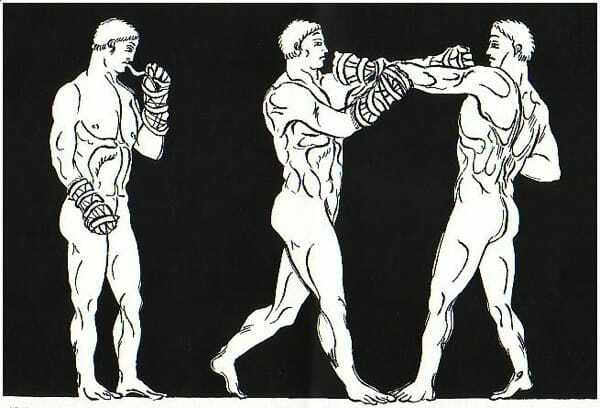 The first was “ano pankration” or upper pankration during which contestants fought upright. The aim was to use punches, kicks, and lethal blows to knock down the opponent. The second phase was “kato pankration” or lower pankration which included joint locking, grappling, and strangulation techniques to defeat the opponent. Pankration gave its players the freedom to develop their own style. Fighters even got nicknames according to their unique method of defeating their enemies. Initially, the players fought with bare hands and naked, oiled bodies. Later, thong wrappings were used to cover their hands and forearms. Part of the ancient Greek pentathlon, the discus throw dates back to 708 BC. In ancient times, the discus was made of lead, stone, iron, or bronze depending on the availability of the metal in ancient Greece. Athletes hurled the discus in a spinning motion. The distance the discus reached depended on the weight of the thrower’s body and the discus, and the throwing technique. In many ways, this sport was a test of both the thrower’s strength and the accuracy of the throwing technique itself. Homer mentioned the discus throw in his epic, the Iliad. 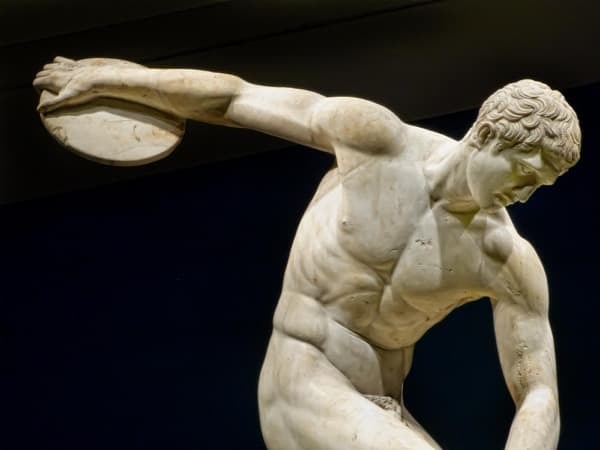 Furthermore, Myron, an ancient sculptor, documented the game in his sculpture of an athlete preparing to throw a discus. Today, both the shape of the discus and the technique of throwing it is similar to that of ancient times. Moreover, the game has not undergone any major changes, and remains practically the same as it was then. Jumping is believed to have links with ancient Greek warfare. The Greek countryside was filled with ravines, and the soldiers’ ability to jump across wide distances during battle was unmatchable. Adapted as a sport, jumping became part of the pentathlon in the ancient Olympic Games. Unlike the modern-day long jump, athletes in ancient Greece had stone or lead weights known as halters attached to their hands. Halters were made in the shape of either dumbbells or cones with depressions to help the athlete grip them. The pit was 50 feet (15 meters) long and had a fixed point known as a “bater” from which the jumps were measured. The jumper gained acceleration by running and swinging the weights at the same time. A combination of power, coordination, and swinging were used to achieve a great jump. Running as a sport can be traced back to 776 BC in Greece. 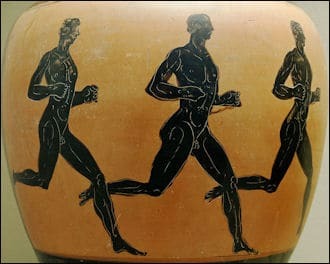 The ancient Greeks developed training programs which helped people to take part in the running events organized during the Olympic Games. The Greeks loved to watch running events and wealthy, generous spectators showered the winners with precious gifts. The sport was unquestionably physically challenging, and there were different types of foot races of varying lengths. The standard distance of the races was measured in the stade or stadium, where a single stadium measured approximately 185 meters. The one-stade race was the most prestigious and which the legendary founder of the Olympic Games could allegedly run in one breath. Other events were the dolichos and two-stade races. The dolichos was a 20 or 24-stade race. The races which were longer than one stade required runners to turn 180 degrees around a post located at either end of the stadium. Also known as palé, ancient Greek wrestling was one of the most popular sports in the Greek games. To win a match, a wrestler had to score three points. A point was awarded when one of the opponents touched the ground with his hip, back or shoulder, accepted defeat due to a submission hold, or was forced out of the wrestling area. The competitions followed an elimination-tournament format under which the bout continued until one wrestler was crowned the victor. The wrestling area was a square plethron or stremma. 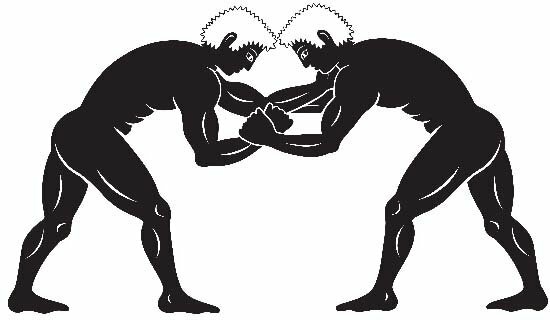 Wrestling was added as a sport to the Olympic Games in 708 BC and the event came under the pentathlon category. Wrestling was a showcase of strength and was represented in Greek mythology by Heracles. Horse races were prominent in ancient Greece and formed an inevitable part of festival celebrations. They were listed under the Olympic Games as equestrian events. The races took place at a hippodrome which had two turning points where most of the accidents occurred. Wealthy people were able to afford the horses which competed in these racing events, and it was the owners who were given the title of victors and not the riders. This gave women an opportunity to win horse racing events without actually having to participate. The sport of horse racing started to lose its importance when the Romans took over. Not everybody was able to travel the long distances to various regions of the Mediterranean with their horses, and the sport in Greece started to decline. The javelin throw was among five events in the ancient Greek Olympic pentathlon. The competition took place on a running track where the athletes ran a few meters to the starting point and then threw the javelin as far as possible. The wooden javelin was about the height of a man. The difference between the contemporary javelin throw and the ancient technique is that a leather loop was attached to the spot at which the javelin was held. The athlete could then artificially extend the length of the arm by placing one or two fingers in the loop. This also gave the advantage of greater acceleration of the javelin over a longer distance. Moreover, the loop made the javelin rotate on its axis which gave more stability to the throwing process. Sport in ancient Greece played an important role in society. 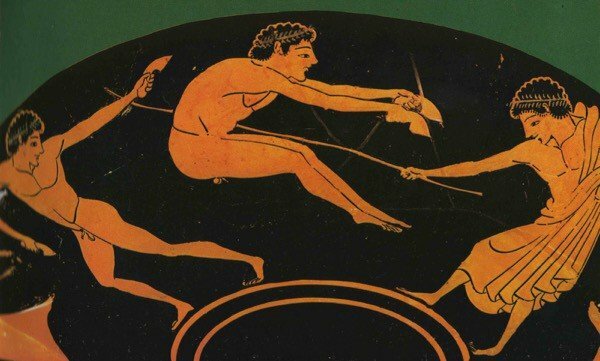 Originating from the skills of warriors, the games in Greece were both athletically and culturally significant, and have become the foundation of the modern-day Olympics. The Greeks have been a highly influential civilization. From art to architecture they have ruled as kings. Add the ancient games to the list and you can see how their history is still having an influence today.